The processing of our Neem Leaves is done using highly advanced techniques in order to remove all kinds of impurities in one go. We are an experienced name, which is engaged in manufacturing, exporting and supplying Neem Leaves. Packed using high quality packaging material, our Neem Leaves remain fresh for a longer period. 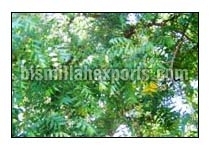 Obtain from us, Neem Leaves in small as well as bulk quantities. Twigs of neem are also used in India and Africa as toothbrushes. Nowadays toothpastes with neem extracts are also available commercially. Neem has anti-bacterial properties that help in fighting against skin infections such as acne, psoriasis, scabies, eczema, etc. Neem extracts also help in treating diabetes, AIDS, cancer, heart disease, herpes, allergies, ulcers, hepatitis and several other diseases. Intersecting Facts : A Saudi philanthropist planted a forest of 50,000 neems to shade and comfort the two million pilgrims who camp each year on the Plains of Arafat (a holy place where the prophet Muhammad is said to have bidden farewell to his followers). And in the last decade neem has been introduced into the Caribbean, where it is being used to help reforest several nations. Neem is already a major tree species in Haiti, for instance.